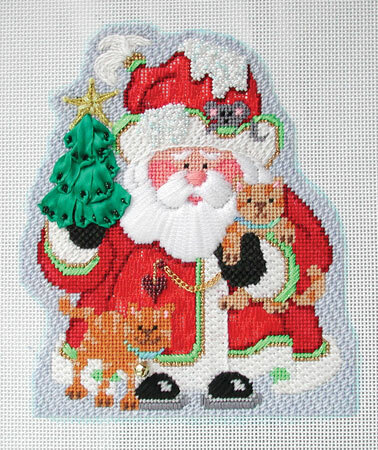 A few weeks ago I mentioned that I had been working on Strictly Christmas’s Squatty Santa with Cats. At first I wasn’t sure what I wanted to do with him to make him special. Ultimately I did decide what to do and it all worked. He is darling! I started with the basics. Santa’s face, his shoes, his mittens, the cats. All the no brainer stuff. Then came the rest. His coat is a darning pattern of fish. Subtle but cool. I loved the stitching the snow on his hat. It’s row beaded, but somehow that looked too straight, so then I went back and beaded some more on top of what was already done. Lots of beads crammed in in no particular order. It looks sparkly and encrusted with snow. I’ll be doing that again. The other part I really enjoyed was the trim on his coat. It’s Nobuko but worked on its side. It gives an entirely different look than nobuko stitched in the traditional manner. It’s stitched in 2 ply Cashmere from Gloriana. Now there’s a yummy thread. Santa is off to the finisher. More pics when he returns. « Previous: Great Finishing makes all the hard work worthwhile! I love the snow! Can we borrow your idea??? The tree is also a wonderful idea! Can’t wait to see how the finisher does this one. I like to use the darning stitch for words as weel, so I applaud the coat done in fish!